We love it here and you will too. If we could beam you to Chimney Pond and didn’t tell you where you were you would think you were in the heart of the Rockies or the Sierra. 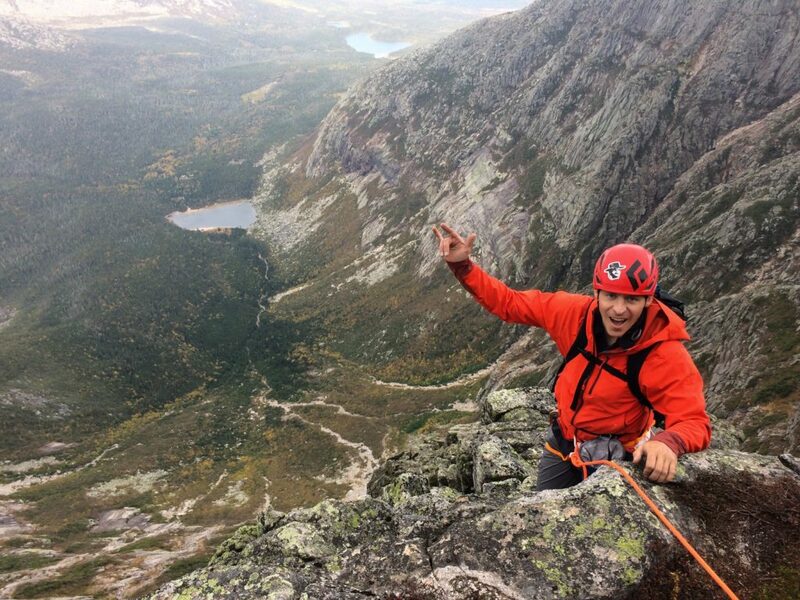 Rising 2000′ above Chimney Pond the walls of the Katahdin’s South Basin offer the best alpine-style climbing and mountaineering climbs in the Eastern U.S. While all the routes demand a high degree of physical fitness just to get there and back, there is a wide spectrum of difficulty from primarily 4th class to 5.10 and above. A guided ascent of Katahdin is ideal for climbers want to climb alpine multi-pitch rock climbs but don’t yet have the personal skills, gear or confidence to do it completely own their own. Rock climbing on Katahdin rivals western alpine climbing and many compare the quality of the rock and the setting to that of the Tetons. The climbs have all the ingredients of a great day in the mountains – a predawn departure, a 3 – 4 miles approach to warm you up, lots of 3rd and 4th class scrambling terrain followed by the reward of some great rock climbing in a spectacular setting. And then you have to get down. Most climbs on Katahdin require a 10 – 14 hour day from car to car. The most popular route on the mountain straight up the striking central buttress in the South Basin cirque. Lots of airy 3rd – 4th class climbing lead to the base of the buttress. Then climb a chimney and squeeze behind the huge flake to emerge on on a tiny perch overlooking Chimney Pond and the entire south basin. From here, jam a striking crack to a sharp ridgeline which is followed for several hundred feet to the famed Knife Edge and the summit. The Flatiron shares the Armadillo approach then leads of to the right up Flatiron Buttress. The crux pitch then tackles 165′ of the best crack climbing on an alpine peak. Above the 4th class ridge continues several hundred feet before topping pretty much on the summit of Katahdin. 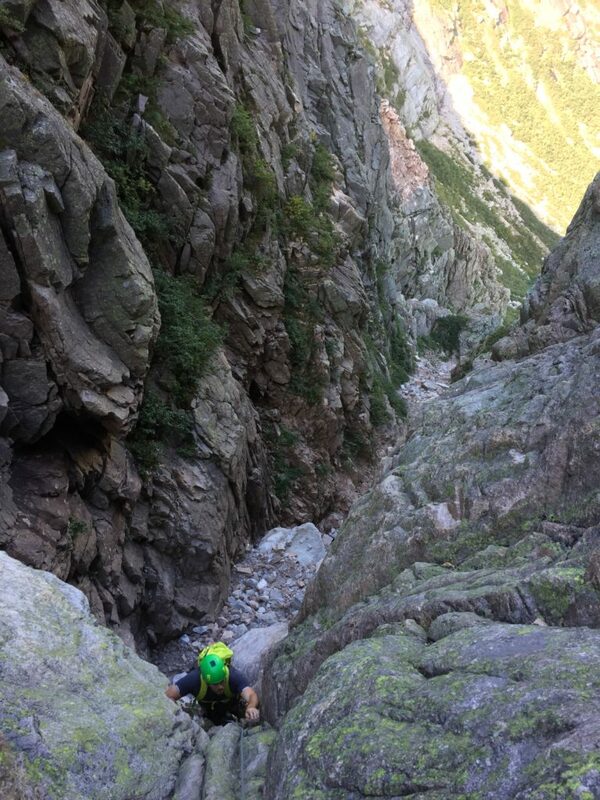 Excellent introductory alpine route for the hiker making the transition into technical mountaineering routes. 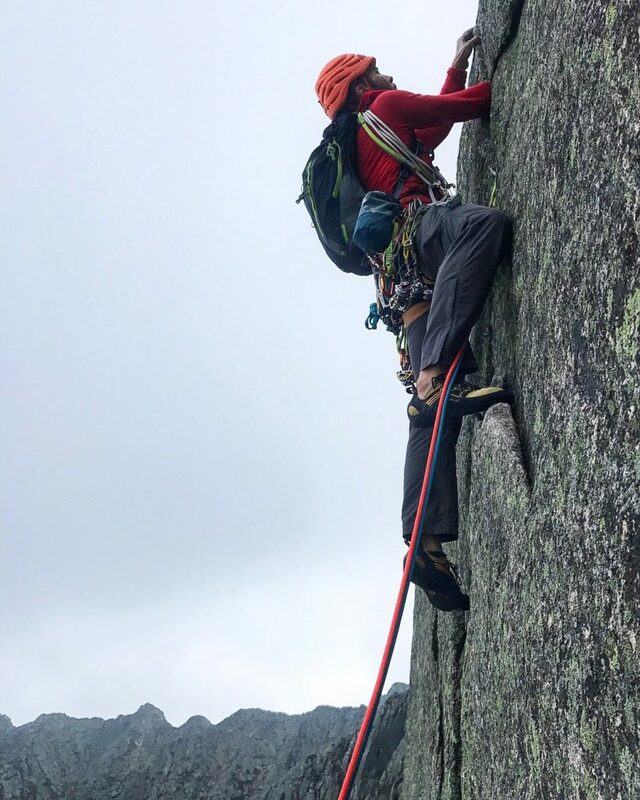 A mildly technical 2000′ couloir that directly connects Chimney Pond to the Knife Edge. For the adventurous, this is a much more exciting way to the summit than the trails. Pamola Four (III, 5.5-5.8) A long (7-12 pitches) and varied ridge line. A great introduction to alpine climbing with outstanding exposure and great views. Leads to the summit of Pamola Peak. A parallel climb to Pamola Four but on a completely different butress. Hanta Yo (III, 5.8) The most popular route in the north basin. The route climbs the right side of the North Basin headwall – one of the largest rock faces in the east. If you have aspirations to climb alpine routes in places like the Sierra or the Tetons or just want to enjoy great alpine climbing in New England then come to Katahdin for a few days of fun climbing in an amazing setting. Katahdin hosts some of the premier alpine rock climbing in the North East. Over the course of the three days you will have an opportunity to climb routes in both the North and South Basins. Hanta Yo (5.8) and the Nose (5.4) are a couple of classics on the 1,000′ Tabor Wall in the North Basin. The South Basin is home to routes like the Armadillo (5.7), Flatron (5.9), The Chimney (5.5), and Baron’s Direct (5.7). There are many other buttresses and features that host lesser known climbs that would also be excellent adventures. During this three day format we hike in and camp for two nights in lean to’s at Chimney Pond. This puts us only a stone’s throw away from being able to harness up for great climbing in the South Basin and significantly shorten’s the approach to the North Basin climbs. Camping at Chimney Pond provides a more relaxing experience and allows us more time to work on skills related to alpine climbing. On day 1 meet early and drive to Roaring Brook campground in Baxter State Park. A 3.2 mile hike gets us to Chimney Pond Campground to make camp. Then it’s off to the rock for the day to climb shorter routes on the Diamonds or in the area of the Chimney. Day two could be spent on The Tabor Wall in the North Basin. A couple of mile approach to Blueberry Knoll and a faint climber’s trail through the bottom of the North Basin leads to the climbing. An ascent of the Tabor Wall brings us to Hamlin peak and down the Hamlin Ridge back to Chimney Pond. Day three could be spent on one of the classic buttress climbs in the South Basin. A trip to the summit and across the Knife’s Edge would round out our experience. After returning to Chimney Pond we would pack up camp and head back to the parking lot at Roaring Brook Campground. Limited to 3 climbers per guide. Call today to make your reservation. Tuition: $595.00 pp. Bring a partner – this course requires at least two participants. Looking for the next step beyond Mount Washington? 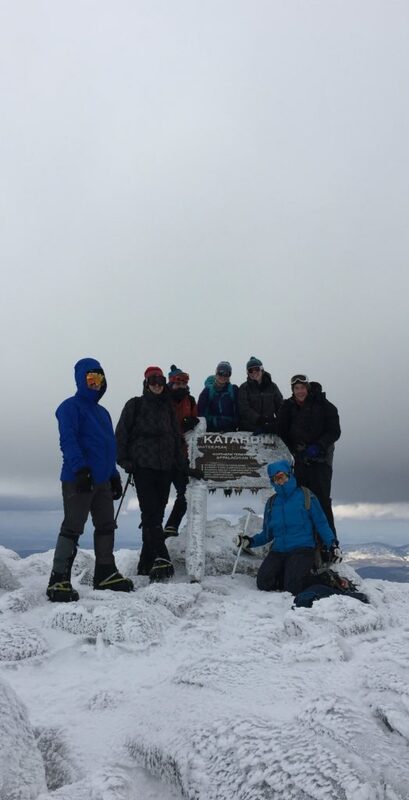 A winter ascent of Katahdin is a great choice. It’s remote location and arctic environment make this one of the most rewarding winter alpine ascents in New England. Our climb begins with a half day ski into the base of the mountain to a winter camp where basic winter camping skills and relevant mountaineering skills are taught and reviewed. We start the climb early the next morning and return in time to ski back to trailhead. This trip is physically demanding but requires no previous winter climbing or camping experience. View slide show from a trip. 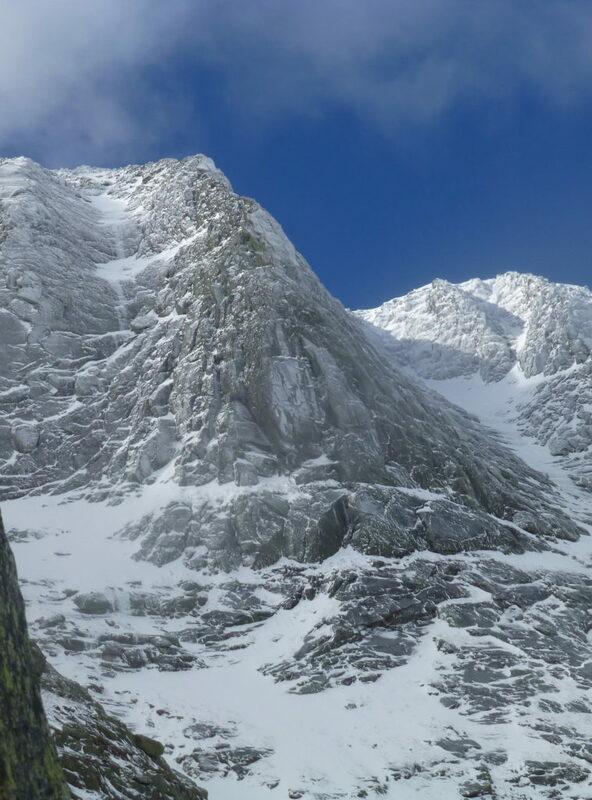 Katahdin offers the most remote winter ice climbing and mountaineering in New England. Whether you choose a summit climb or a challenging ice and snow route on the basin headwalls, its long approach combined with the usual winter challenges make any climb extremely rewarding. Do you have aspirations to climb in the greater alpine ranges of the world? There is no better training ground than a few winter days on Katahdin to prepare you for peaks such as Rainier, Denali, or Aconcagua. This is a physically demanding, intensive 5 – 10 day course covering the many aspects of expeditioning and winter mountaineering. These include equipment and food preparation; sled and ski set up; winter camping skills including preparing tents and snow shelters, stove repair, snow kitchens, and tips and tricks for sleeping warm; snow and ice climbing skills; self rescue skills; navigation and route finding using maps, compasses and altimeters; avalanche assessment and rescue skills and many more. Reservations for winter climbing on Katahdin should be made as soon as possible in the fall in order to obtain space and meet park permit guidelines. A minimum of four days is usually required. Call for details. Alpine climbing, steep ice climbing, avalanche skills, backcountry skiing? Katahdin is New England’s most remote alpine peak and offers a flavor of mountaineering adventure equivalent to an Alaskan peak. Let us design a trip to meet your needs. Reservations for winter climbing on Katahdin should be made as soon as possible in the fall in order to obtain space and meet park permit guidelines. A minimum of four days is usually required.